Last week, I learned how to use the PEER strategy to guide my children in discussion when I read aloud to them. This week, I used another great method to help children build word knowledge and world knowledge during read alouds. “The Power of Interactive Read Alouds,” an article on the IRRC website by Gwen Marra, Ph.D., provides the research base for dialogic reading. 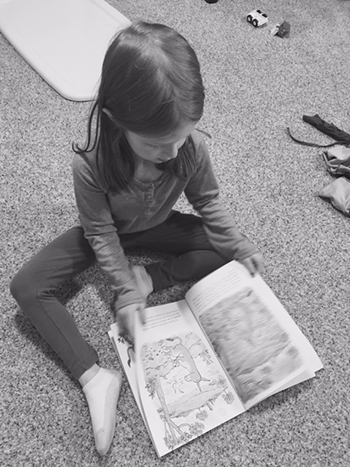 Dialogic reading essentially is talking with your children while reading together in order to help them focus on important vocabulary words and to develop their language and comprehension skills as they retell important information in the book. It is a great way for parents and teachers to “keep tabs” on how well children understand what you are reading together. CROWD is the second strategy provided in “The Power of Interactive Read Alouds.” CROWD is an acronym and each letter stands for different types of questions to ask children when reading aloud: Completion, Recall, Open-ended, Wh-, and Distancing questions. I tried it with my own children and found it to be a great way to see how well my children understood what we were reading. CROWD took more pre-planning than PEER, but the prior work I did was quite helpful in guiding a discussion with my children. I chose Sylvester and the Magic Pebble, by William Steig, for the book we would read together. I skimmed through it myself and used the CROWD question prompts to create questions. I jotted each question on a sticky note and placed it on the appropriate pages of the book. Below you will find the meaning of each letter of the acronym. I also have included some of the sample questions I created to ask my own children. C: Completion Prompts: This works as a sort of “fill in the blank” question for your child. As you are reading, pause on a word and ask your child to say the word that would complete the sentence. Once your child understands why you are pausing, you will not have to keep reminding him what to do. He will know to say the word. This works very well for repeated words in the story or words that correspond to the pictures. R: Recall Questions: Ask your child to recall specific events from the story. This can work at any time during reading, but be sure to finish the sentence or page before asking the question about what happened. What color was the pebble Sylvester picked up? What did Sylvester wish to turn into when the lion came upon him? O: Open-Ended Questions: Ask your child to tell you what is happening in the pictures in the story. Although you do not want your child to confuse the words that tell the story with the pictures that illustrate the story, the pictures often add information or create the scene for the story. What are Sylvester’s parents doing in this picture? Tell me what is happening in this picture. W: Wh Questions: This is a chance to dig a little deeper into how will your child understands the story by asking about some facts or the who, what, when, where, and why (and how) of the story. The wh- question words may begin other question types in CROWD as well, such as the recall, open-ended, and distancing questions. Why are Sylevester’s parents frantic with worry? Why did Sylvester wish to become a rock? How did Sylvester become a donkey again? D: Distancing Questions: Ask questions that relate something in the story to your child’s life. As my children like to chatter about their own lives, they enjoy these types of questions. However, I have to make sure that their answers stay connected to the story and don’t start to take us in different directions—away from the author’s meaning. What would you have done if you had the magic pebble, and a lion approached you? Sylvester’s family chose to keep the pebble. Would you choose to keep it in a safe like they did? Both PEER and CROWD are methods parents can use to create great discussions about reading. For more information on dialogic reading and how to create interactive read alouds, check out this white paper. Also, here is a CROWD bookmark that parents can use to help remember what types of questions to ask when reading with children.